Win a Copy of Print, Make, Wear + 2 Yards of Poly Crepe de Chine! Take your apparel design to the next level with new book Print, Make, Wear: Creative Projects for Digital Textile Design by Melanie Bowles, textile designer and co-founder of The People's Print! This book features beautifully illustrated step-by-step tutorials to walk you through creating your own printed textile design with hands-on traditional craft methods and digital techniques including the latest CS6 software Adobe Photoshop and Illustrator. Print, Make, Wear will guide you through the process of digital textile design to create truly original designs, ready to print, ready to wear! We had the opportunity to thumb through a copy and were blown away by the expert tips and beautifully constructed garments. Melanie does a wonderful job walking readers through each project while empowering creatives to dream up their own interpretations of each garment. To celebrate this wonderful design resource, we're giving one lucky community member the opportunity to take home their very own copy along with two yards of our most elegant fabric, Poly Crepe de Chine! This new fabric is a lightweight 100% polyester crepe fabric that is perfect for projects that require a soft drape and a delicate weight. Get started on your first completely custom garment created using Print, Make, Wear + Poly Crepe de Chine! Enter by Tuesday, September 1st, 2015 for a chance to win. The winner will be contacted via email on Wednesday, September 2nd. 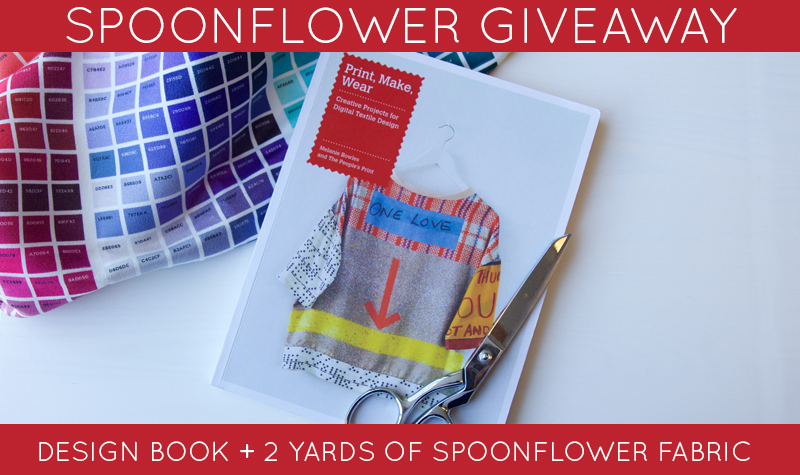 Join us for The Spoonflower Handbook Launch Party! 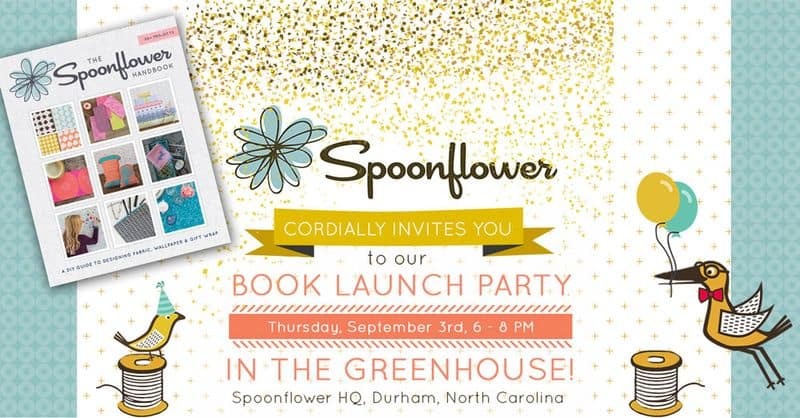 Please join us for a book signing and party here at Spoonflower HQ on Thursday, September 3, from 6 to 8pm, to celebrate the release of The Spoonflower Handbook! We are so excited to release our very first book, and we’re celebrating the occasion with friends, food, fun and photos! Join us in the Greenhouse, our classroom and community space here at our Durham, NC headquarters, as author and Spoonflower co-founder Stephen Fraser discusses his favorite projects from the book. Then have your copy of the book signed, enjoy a tour of the Spoonflower facilities (you’ll see all of the printing magic happen! ), stop by our selfie station (complete with giant plushies! ), and meet new textile-obsessed friends from the area! We'd love to see you here, so tell your friends and RSVP today!